He is a priest; his name is Anthon Faber, but he asks his parishioners to call him Toni. He is a Canon, a Ph.D. and the Pastor of St. Stephen Cathedral in Vienna. He enjoys the full support of Card. Christoph von Schonborn, Archbishop of Vienna, one of the dearest disciples of Benedict XVI. Above you see Toni waltzing at the opening ball for the 2011 season of the Vienna Opera. He is dancing with his long-time "best friend," television reporter Claudia Stockl, with whom he is often seen in public appearances, check below last two rows. In the first row below, you see Fr. 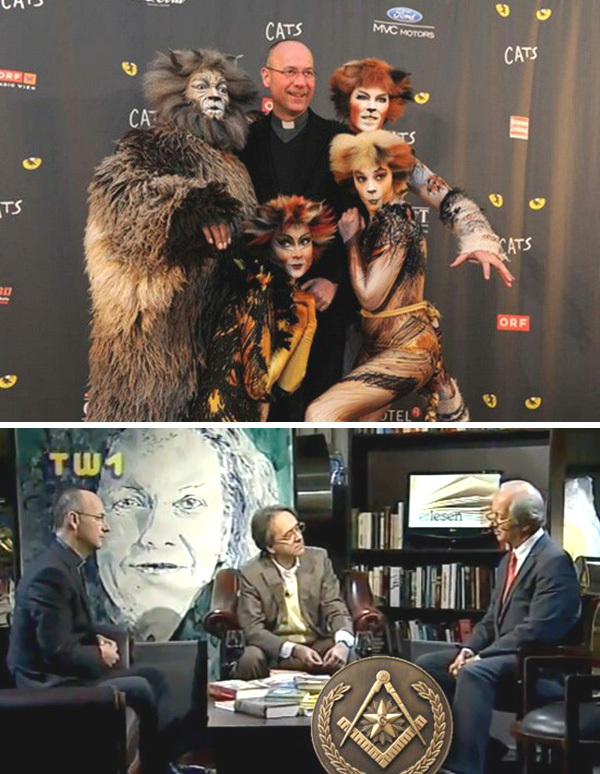 Faber posing with the actors at the première performance of the theater play Cats. In the second row, he is being interviewed in a TV talk show along with the Grand Master of Austrian Freemasonry, Michael Krauss. On the relation between the Catholic Church and Freemasonry, Fr. Toni stated: "I personally know many Freemasons who are committed Catholics, working in the Catholic Church, but also offering their contribution to the Lodge and working in it. And I believe that with so many people of good will among the Freemasons, we can work together for Austria's common good."